He is one of the most infamous kings in English history – Henry VIII but how much do you really know about him? Thanks to our contributor Sari Graham for putting this quiz together. Enjoy! We hope you had a lot of fun taking this quiz. Be sure to check out all the quizzes in the menu of this website. Who were Henry VIII’s parents? His parents’ union formally ended the War of the Roses-Elizabeth of York was the eldest daughter of King Edward IV of the Yorkist faction, and Henry Tudor was the Lancastrian heir through his mother- she was a great-granddaughter of John of Gaunt, fourth son of King Edward III. Including Henry, how many of his siblings survived childhood? Arthur, Margaret, Henry, Mary all survived childhood and made excellent marriages. Both of his sisters became Queens, and had he survived, Arthur would have been King of England. Edmund died aged 16 months and Katherine died a week after her birth. 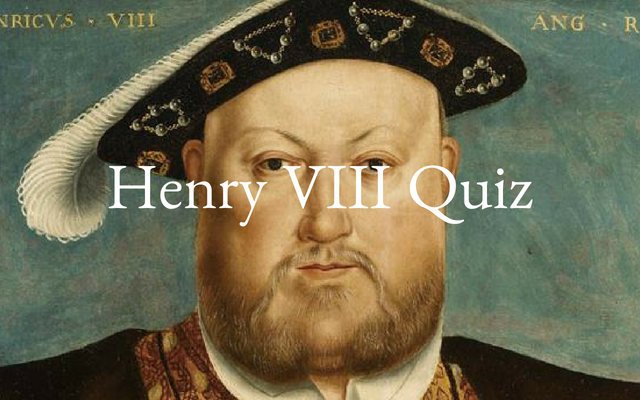 Prior to becoming the Heir-Apparent, what title did Henry VIII hold? King Henry’s first wife, Catherine of Aragon, was a foreign bride. From which country did she hail from? Catalina, as she was known in her native Spain, was the youngest child of King Ferdinand of Aragon and Queen Isabella of Castile-yes, that Queen Isabella. King Henry VIII was known for being a ladies man. One of his mistresses bore him a son, the only illegitimate child he acknowledged during his reign. What were their names? Bessie is considered to be the longest-lasting mistress of Henry VIII, and gave birth to their son Henry around 15 June 1519. He was later created Duke of Richmond and Somerset. ‘Fitzroy’ means “Son of the King.” He died of tuberculosis/lung infection in 1536. What did the Crown of Ireland Act 1542 accomplish? It created the title “King of Ireland” for Henry VIII and all of his successors. It was a satirical play about the “savage” nature of the Irish. The parliament of Ireland passed the act, thereby changing the previous title of ‘Lord of Ireland’ and making Henry VIII the first King of Ireland. The act was not repealed until 1962 under the Statute Law Revision. Where is King Henry VIII buried? Henry VIII’s casket lies in a vault under the choir in St. George’s Chapel, Windsor. He was buried alongside his third wife and mother of his heir, Jane Seymour. King Charles I is also buried in this vault, as well as a stillborn son of Queen Anne. Upon seeing his soon-to-be fourth wife for the first time, Henry felt that he had been deceived as to her physical appearance, and referred to her as a “Flanders Mare.” He said, “She is nothing so fair as she hath been reported,” and urged Cromwell to find a way to not go forward with the marriage. The couple was married for a short 6 months before obtaining an annulment on the grounds of non-consummation, which Anne freely agreed to. They remained good friends until Henry’s death. What occurred on 7 June 1520? In 2011, bioarchaeologist Catrina Banks Whitley and anthropologist Kyra Kramer shared an interesting theory regarding an aspect of Henry VIII’s genetics. What did this theory entail? If Henry was Kell-positive, this could explain his wives’ inability have concurrent successful pregnancies. If a fetus inherits the Kell-positive status, this means the mother would build up Kell antibodies. While a first pregnancy wouldn’t be affected, any future pregnancies resulting in Kell-positive fetuses would be attacked and destroyed by those antibodies. This could explain the numerous miscarriages and stillbirths for Catherine of Aragon and Anne Boleyn. Princess Mary likely won the genetic lottery in being born Kell-negative. Prior to the Reformation, Henry was a devout Catholic and wrote a theological treatise titled “Defence of the Seven Sacraments,” which was in reply to Martin Luther’s writing “Prelude on the Babylonian Captivity of the Church,” and his harsh criticisms of the Catholic Papacy. Henry was an intellectual, and could read and write in which languages? Henry is often credited with the composure of “Greensleeves.” While this piece of music is not actually his work, which of the following is? Henry VIII executed a lot of people for various reasons during his reign, and this included his extended relatives. Who of the following was not executed by order of Henry VIII? Edward Plantagenet was executed in 1499 during the reign of Henry’s father, Henry VII. He was the son of George Plantagenet, 1st Duke of Clarence and Isabel Neville, which made him a nephew of Edward IV and a cousin to Henry VIII’s mother Elizabeth of York. His elder sister was Margaret Pole, Countess of Salisbury. Henry VIII is credited with creating England’s first permanent navy. In 1512, his flagship was completed. What was the name of the ship? The Mary Rose served for 33 years in the navy, seeing battle against France, Scotland and Brittany. It was one of the largest ships in the English navy during this time, and after a rebuild in 1536 was one of the first ships that could fire a broadside attack. The Mary Rose capsized and sunk on 19 July 1545 with a crew of about 400 men aboard. The cause of the sinking is still debated. The wreckage was found in 1971 and was raised in 1982. In his youth, Henry VIII was a fit and attractive man. He was also inordinately tall for the time-how tall was he? Henry towered over many of his contemporaries, however tall genes seem to run in the family; his maternal grandfather Edward IV was 6’4”, and his grandniece Mary, Queen of Scots was 5’9”. His ancestor John of Gaunt put them all to shame, standing around 6’9” tall! Condemned without a trial and publicly executed for high treason, Cromwell’s death was a brutal display of ineptitude by the executioner, who struggled to severe his head with multiple strokes of the axe. Henry VIII later regretted his decision to have Cromwell executed. Drinking water wasn’t common practice in the Tudor times, as they didn’t have the purification systems we have today. What was Henry VIII’s preferred beverage? Henry did not enjoy the hops beer that was popular on the Continent, and preferred the much stronger English ale. He even tried to ban the brewing of hops beer in England, despite it being the popular choice for royalty and commoners alike. An unusual and alarming event happened while Henry VIII’s casket was lying in state at Syon Monastery prior to his funeral. What happened? The decomposition process of a dead body creates gases, which become trapped and usually collect in the abdominal cavity, causing a corpse to look bloated over some time. Given his rotund size at the time of his death and the fact that the embalming didn’t start until some 3 days after he died, when his body finally ruptured to release the trapped gas, it created quite the mess inside the monastery! How old was Henry when he ascended the throne in 1509? While technically in his 18th year, Henry’s birthday on June 28 was 4 days after his coronation, which meant that he was of age to rule without a regency council. Of the six wives of Henry VIII, who was the oldest and youngest when they died? Catherine of Aragon was 50 years old at the time of her death, and Katherine Howard was 18-19 years old when she was executed. Anne Boleyn was between 29-35 years old depending on what year you believe she was born, Jane Seymour was 28, Anne of Cleves was 41, and Katherine Parr was 35-36 years old. Which of Henry VIII’s wives outlived him? Wives number four and six outlived the notorious king. Katherine Parr died in 1548 after giving birth to a daughter with her next husband, Thomas Seymour. Anne of Cleves outlived all of his wives, dying most likely of cancer in 1557. Henry VIII had 6 wives, but not all of them produced surviving children. Whom did he have children with? Queen Mary I was the only surviving child by Catherine of Aragon, Queen Elizabeth I was the only surviving child by Anne Boleyn, and King Edward VI was the only child of Jane Seymour. Henry VIII ordered the execution of Henry Courtenay, Marquess of Exeter on 9 December 1538 for treason. What was the connection between the two men? Henry Courtenay was the son and heir of William Courtenay, 1st Earl of Devon and his wife, Princess Catherine of York, who was a younger sister of Henry VIII’s mother Elizabeth of York, making them first cousins through their mothers.